There's a interesting idea about silencing those who are "special"/gifted. But the movie tries to make it too much about comic books; my personal impression is that removing the love for "comic books" would make the movie much more interesting. I didn't realize this was a sequel to two movies, and at first was like, "this is a ripoff of Split." I never saw Unbreakable so didn't know the connection there until after reading reviews here. Anyway, it was an entertaining movie. Some weird transitions, editing, and sound mixing, as well as and a lack of understanding how computers work dropped the rating a bit. The general description of the movie, Dunn tracks down Crumb, is only like the first 10 minutes. This is the true most ambitious crossover event of our times. He lost his touch a while ago. He can still drum up an audience somehow. Dull, dreary effort from Shyamalan is a glum and ponderous affair; loaded with self-importance and clumsy exposition, inexplicably delivered multiple times in case we missed any of the shallow, facile philosophy at play. McAvoy is relentlessly hammy, to call Willis' performance constipated would be a undeserved compliment; only Jackson manages to inject any style into the production (when he's not knocked out in a wheelchair). Some good directorial flourishes at the start promise so much more. It looks and feels like a very cheap movie. It's the performances by the 3 main actors that raises the level a bit. As usual Shyamalan doesn't understand modern technology at all. All in all disappointing and unless you've seen the two previous ones, there's no need to watch this one. Just watch it for McAvoy's performance. The rest is just... Night Shyamalan being Night Shyamalan. Worth watching for Mcavoys performance. "Glass," unfortunately, closes the door on the series and does it with the last rhaspy gasp of the Shyamalanalanaissance. The first half is slow and the second half has one of the lamest trademark twists of Shyamalan's career. Some of my score may even be biased too high because it took twenty years to see David Dunn and Mr. Glass again, but Shyamalan doesn't do the fanboys any favors, here, closing it with such finality. He'll kick himself when he craps out another, "After Earth," I promise. woeful ending to the series. Much can be said about Shyamalan's reputation, as well as it may be doubted whether he is still capable as a filmmaker at all. Yet, the craft behind Glass is, at the very least, passable. Even the script has its good parts, but when things are getting bad, they are simply offensive, especially to those who remember and like Unbreakable. To some it may feel a bit slow-paced, since we are used to constant action and fast storytelling. It is however, extremely entertaining and enjoyable. The music, the suspense, the acting, the camera work, the positioning, the dialogues... All is brilliant and captivating. The twists are perfect and I really couldn't ask anything more of the movie. Wholeheartedly recommend. Excellent departure from the current mold of superhero films. Lots of unexpected twists. Excellent cast. Pacing is perfect. Watch this to finish up the trilogy but don't expect much. I enjoyed the first 2 movies enough to go see Glass in theaters. It was so slow that I started wishing it would end already so I could go eat dinner. The Shyamalan style twist was so weak it took me a while to figure out that was all we were going to get. As someone who's a massive Unbreakable fan and hasn't seen Split, I thought this was a completely rushed product, full of dull exposition dialogue, absolutely shittily filmed action scenes, and a bunch of other crap that doesn't make sense. The worst offense is that this should be an interesting story to explore, but Shyamalan really fucks it up with complete filmmaking and storytelling ineptitude here. A completely unsatisfying watch for any fans of Willis in Unbreakable. I smell a sequel.... actually just the stupidest amount of fun. It starts great, and then in typical Shyamalan fashion the movie simply spins out of control. If only the third act had been more, um, is normal the right word here? It's still a decent ending to the trilogy, so I won't complain too hard. Yet omg the last 30-40 minutes were ridiculous af. 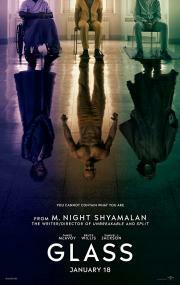 A denouement of not just a trilogy, but of Shyamalan's whole body of work: the plot meanders towards an ultimate affirmation of faith, of proof positive of the supernatural and superhuman, of the revelation of things once hidden. So it connects all of his works to esoteric Gnosticism, of which this is a kind of manifesto. Intellectually, I dug it. But it also represents Shyamalan's worst impulses: he is a genius of film formalism, yet feels the need to mansplain in moments best served visually.